Still, at the very moment anti-tax protesters were emerging as the most powerful force in American politics, handing Republicans landslide control of the U.S. House, the data show that people were sending the smallest portion of their income to the federal government since 1979. During Obama’s first year in office, the average tax rate paid by all households fell to 17.4 percent, down from 19.9 percent in 2007, according to the CBO. The 2009 rate was significantly lower than the previous low of 19.4 percent in 2003 and well below the 30-year average of 21 percent. The tax burden — which includes all forms of federal levies, including income, payroll and corporate taxes — lightened for households across the board, the result in part of Obama’s signature “Making Work Pay” tax credit and other tax cuts passed as part of the 2009 economic stimulus package, the CBO said. 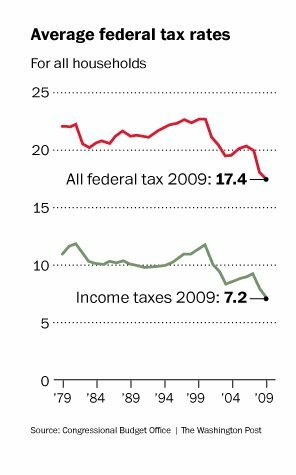 The lowest fifth of earners benefited the most, sending just 1 percent of their before-tax income to the federal government in 2009, compared with 5.1 percent in 2007. The top fifth of earners paid 23.2 percent, compared with 24.7 percent in 2007. The average federal income tax rate also reached a new low, settling at 7.2 percent in 2009 — two points lower than in 2007, the CBO said. Although detailed data are available only through 2009, the CBO said more recent estimates suggest that effective tax rates remained at historically low levels in 2010 and 2011. “However much Republicans try to perpetuate false claims, the facts speak for themselves: Tax rates have never been lower than under President Obama,” said Rep. Sander M. Levin (Mich.), the senior Democrat on the House Ways and Means Committee, which has jurisdiction over taxes. Even with Obama’s proposal to repeal the Bush tax cut on taxable income over $250,000 per year, only about two percent of the country will face higher taxes (and this will be a very small tax increase for most). Republican claims of higher taxes under the Affordable Care Act are also false. In contrast, the Republican plan supported by Mitt Romney will result in higher taxes for the middle class.